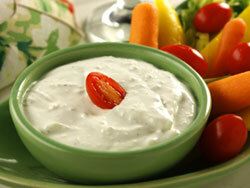 Blue Cheese Dressing: Homemade Blue Cheese Dressing runs rings around bottled. With this dressing being so easy to whirl together, it’s a natural for drizzling on salads, tossing with pasta, or even adding tasty excitement to burgers. 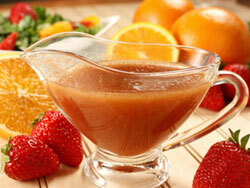 Strawberry Vinaigrette Dressing: A fruit vinaigrette cuts the tang of olive oil and vinegar in salad dressing. 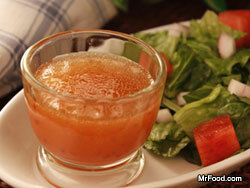 Try Strawberry Vinaigrette and see the wonders it can work for your salads! You can even change it up by using a different flavor of preserves! 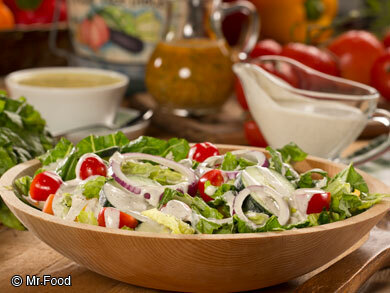 Creamy Italian Dressing: One bite of salad topped with our Creamy Italian Dressing and you’ll instantly know which popular restaurant chain it reminds you of. 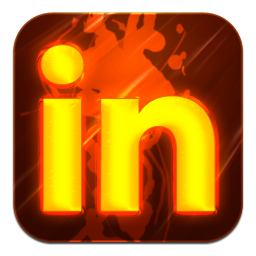 Now you won’t have to make reservations in order to satisfy your craving. Blueberry Vinaigrette Dressing: Shake things up with a homemade salad dressing brimming with the fresh taste of blueberries. They can be found in the produce and freezer section at the supermarket. 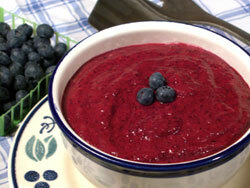 Let Blueberry Vinaigrette brighten your day! Coconut Cream Dressing: Our slightly sweet, slightly tart dressing offers a refreshing change tossed with mixed greens or drizzled over main dishes and steamed veggies. It makes plain coleslaw and fruit salad exciting. Why, Coconut Cream Dressing jazzes up everything! Pineapple Orange Dressing: Fresh homemade dressing wakes up almost anything from tossed salad to spinach salad and even grilled chicken and seafood. Try this zesty dressing that combines fresh pineapple with canned mandarin oranges and a few other pantry staples. Dijon Dressing: Whisk together this easy and flavorful Dijon Dressing in a snap and enjoy it over salads or as a super marinade or as a sauce for grilled veggies! Balsamic Vinaigrette: Balsamic vinegar is an ideal addition to almost any salad dressing but it takes center stage in this Balsamic Vinaigrette. 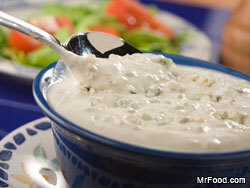 Extra Chunky Blue Cheese Dressing: Got last minute company for dinner and need an easy homemade salad dressing? 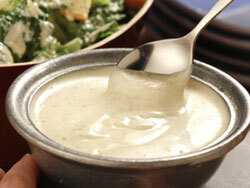 Our Extra Chunky Blue Cheese Dressing whisks together in a flash. Your guests will love it! 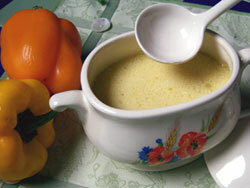 Basic Vinaigrette Dressing: Basic Vinaigrette Dressing is a classic. It’s great as is, but it can also serve as the base for loads of exciting vinaigrette variations, so check the options and make a new dressing every time! 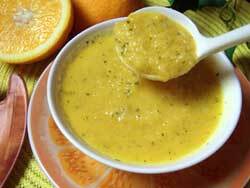 Honey Mustard Dressing: The best thing about this favorite dressing of Mr. Food’s is its versatility. 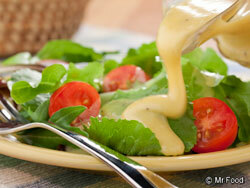 Honey Mustard Dressing is succulent over green salads, steamed veggies and even chicken, fish and meats! 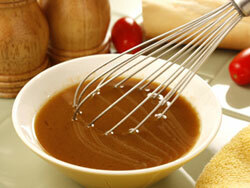 Homemade House Dressing: Great salad dressing is “on the house” with this recipe. You’re sure to impress your family and company with our easy yet flavor-packed Homemade House Dressing. Rich Vinaigrette Dressing: A fresh salad deserves a fresh dressing, and our easy homemade vinaigrette dressing beats bottled by a long shot! 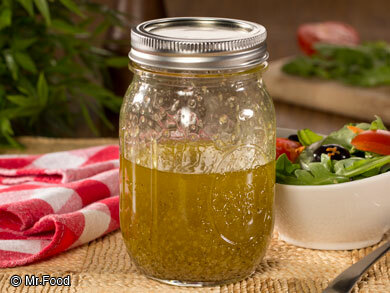 Don’t settle for any other vinaigrette dressing when this rich one whips up in no time. 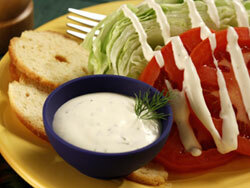 Our Own French Dressing: What can we say about this creamy homemade French dressing? C’est magnifique! Whip up Our Own French Dressing in no time, and enjoy one of Mr. Food’s favorites for yourself. 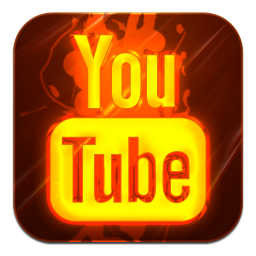 And it’s versatile enough to serve over anything! 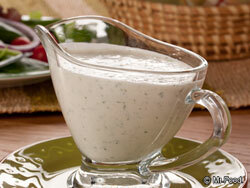 Creamy Pepper Dressing: Creamy Pepper Dressing strikes just the right balance between tang and creaminess. This smooth dressing is great on salad, and can be a base for other dressings, too. 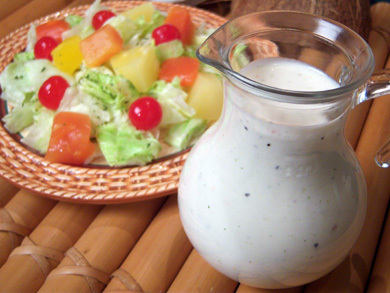 Light Caesar Dressing: By substituting just a couple of light ingredients in this recipe for the usual high-fat ones, we get all the great gusto of Caesar dressing, but with a lot less fat. 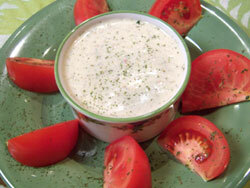 Flo’s Russian Dressing: Art couldn’t get enough of his sister’s homemade salad dressing. 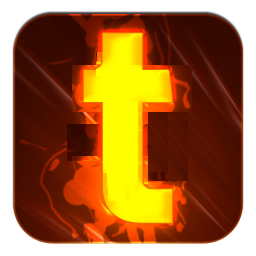 He loved it so much, he named it after her and decided to share it with the world. 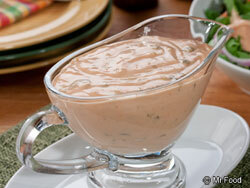 Flo’s Russian Dressing is one of our favorites in the Test Kitchen, too! Honey Poppy Seed Dressing: Just like at a restaurant, we can have a special “house dressing” of our own, that makes us shine. 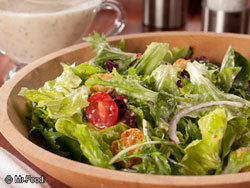 Try drizzling your favorite greens with our easy, fresh-tasting Honey Poppy Seed Dressing! 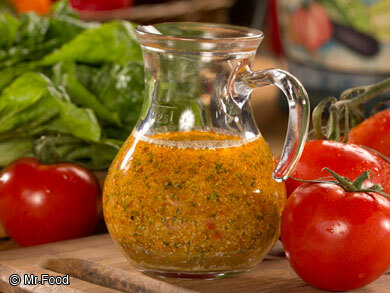 Almost Famous Italian Dressing: Give the fresh-tasting ingredients for this Almost Famous Italian Dressing a whirl in your blender, and drizzle your salad with big taste! Warm Bacon Dressing: Mmm! 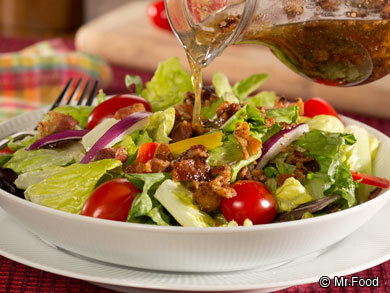 Any salad would love to be dressed with this easy-to-make Warm Bacon Dressing! 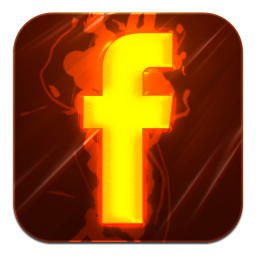 But don’t stop there…it’s great over almost any vegetables! 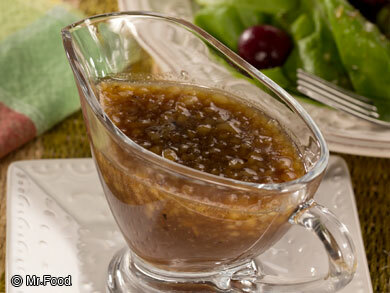 Warm Honey Walnut Dressing: There’s nothing like homemade salad dressing, and this warm honey walnut dressing, with the surprise of sweet dark cherries, takes the prize for a tangy and sweet flavor combination that’s guaranteed to please. Ranch Dressing: At one time or another, we’ve all fallen into the bottled salad dressing rut and wished for a fresh flavor to drizzle on our greens or toss with our tomatoes. Why not make your own dressing? 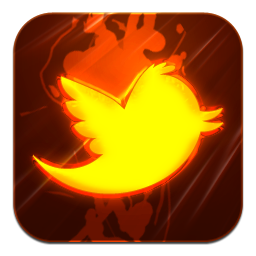 I always do! It’s easy, tasty, and inexpensive, too! Watermelon Raspberry Vinaigrette: You’ve had raspberry vinaigrette, but Watermelon Raspberry Vinaigrette? Wow your guests with this unusual, tart-sweet dressing!